Design and jewelry lovers will find lots to love at this teeny five-star boutique. Part of the Small Luxury Hotels Group, this lovely abode pays homage to its jewelry-shop origins with a small museum in addition to Art-Nouveau and Modernist touches throughout. With a location directly on the ever-busy Las Ramblas pedestrian street, the hotel is a discreet getaway from the throngs of tourists hustling up and down on a daily basis. With a focus on service and art, Hotel Bagués is a great place for design and high-minded travelers who want a catered and intimate hotel experience. The original jeweler still has a shop nearby the hotel. Ask the front desk for directions if you want to bring home a pricy souvenir. Every room in the hotel is like its own mini-museum. Encased in glass are jewelry pieces that date to the 1800s. Beyond the jewels, there are light wood floors, deep, rich leather day beds, concrete and dark wood walls, and modernist headboards that pay homage to renowned artist Rennie Mackintosh. You’ll find Nespresso machines in all rooms and some suites feature outdoor Jacuzzis. YOU SHOULD KNOW Balconied rooms look over Las Ramblas – that can be both good and bad depending on noise levels. Bathrooms have onyx floors and walls and feature shower/tub combinations and raised sinks. White Company products are standard. The dark and brooding lobby has a mix of Asian and Art Nouveau influences with polished marble, comfy couches, and a back-lit lobby bar. If you go up one level, you’ll find the hotel’s gallery with original Art-Nouveau and Modernist jewelry pieces. The rooftop pool is an incredibly narrow rectangle with sweeping views of the city. White loungers and wicker furniture sit to one side and the pool is open from 10 am to 8 pm. Next to the gym is a single massage room in addition to a steam room. Inquire with the hotel for treatment options. The very small gym is encased in mosaic tiles and features two cardio machines and a smattering of free weights. In the lobby lounge, there’s an all-day menu for breakfast, lunch, and dinner with Mediterranean options. On the roof, guests can order from a tapas menu, but only during summer months. Cocktails and tapas can be had on the rooftop during summer months, and it also boasts the occasional live-music session. The lobby bar also mixes classic cocktails all year-round. 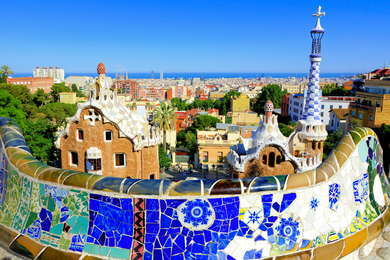 With an address right on Las Ramblas, walking to dozens of restaurants, bars, and attractions is a breeze. If you don’t like walking, you’re in luck because there’s a never-ending cavalcade of taxis that patrol this street and there’s a metro stop a few minutes away. Be mindful of your belongings along Las Ramblas as the pedestrian street is a known pickpocket haven. Open market lovers should make the pilgrimage to La Boqueria (2-minute walk), one of the best markets in the world that houses over 200 food stalls and restaurants. Fonda España (5-minute walk) inside Hotel España is a Michelin Bib Gourmand restaurant with incredible Catalan cuisine. History buffs might want to check out Boadas Cocteleria (3-minute walk), the oldest cocktail bar in Barcelona. For a unique and laid-back joint with arguably the best cocktails in town, head over to Two Schmucks (9-minute walk). Hotel Bagués is a unique hotel with just 31 rooms and an intensely dedicated staff that personalizes every visit for guests. The location can be good or bad depending on your perspective – but being on Las Ramblas means you’re in a central spot that has access to all major attractions and tons of food, drink, and shopping options. This hotel differentiates itself with its art collection, priceless jewelry that was made on-site at this former jewelry shop. There’s a dedicated museum to the collection, and every guest room features more of the jewelry encased in glass.